At this year's Vivid - Sydney's festival of light, music and ideas - we were part of the team who created a talking, interactive sculpture 'Ray'. Ray was the festival's first fully solar powered installation and the first with its own personality which could be found via his website and tweeting via #HiRay. 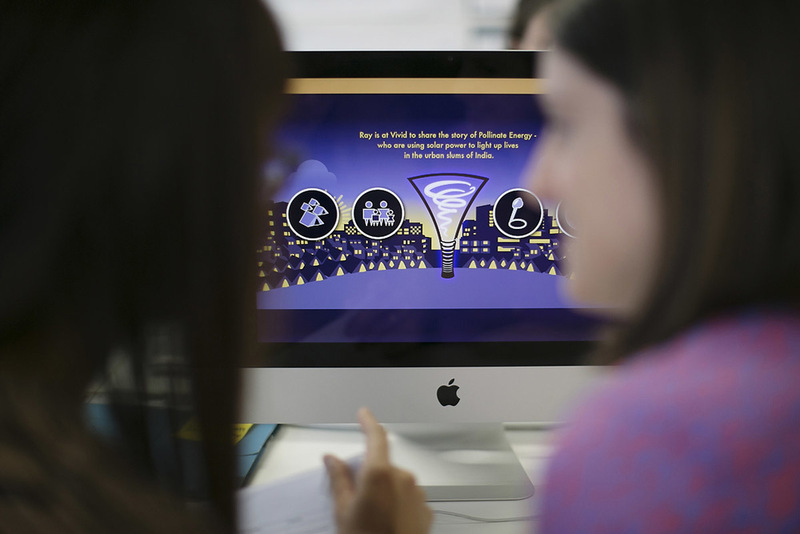 In a collaboration between Pollinate Energy, amigo & amigo, S1T2 and Southern Cross University, we pulled off Vivid's first ever solar-powered light sculpture and in an amazing bonus, it turned out to be Vivid 2014's most popular sculpture, according to IBM's 'Heart of the City' big data project, with 353,000 interactions. Check out the video below for a taste of 'Ray' in action. Pollinate Energy set out to solve a number of problems with a simple solution. The promise was to deliver solar lighting in urban slums in India - a) alleviating energy poverty for 400 million people without light in their homes and b) helping to solve climate change by leap-frogging fossil fuel infrastructure in a developing nation with a huge population. While they have been working at this, they've also delivered a whole range of social and health benefits such as more affordable energy, better education for kids who can now study after dark and a reduction in the inhalation of smoke from kerosene lamps. Pollinate were seeing huge successes in India, their fellowship and young professionals programs were reaching Australian young professionals and companies and Kat was awarded the UN 'Momentum for Change' Award, yet awareness of their work in Australia was relatively low. 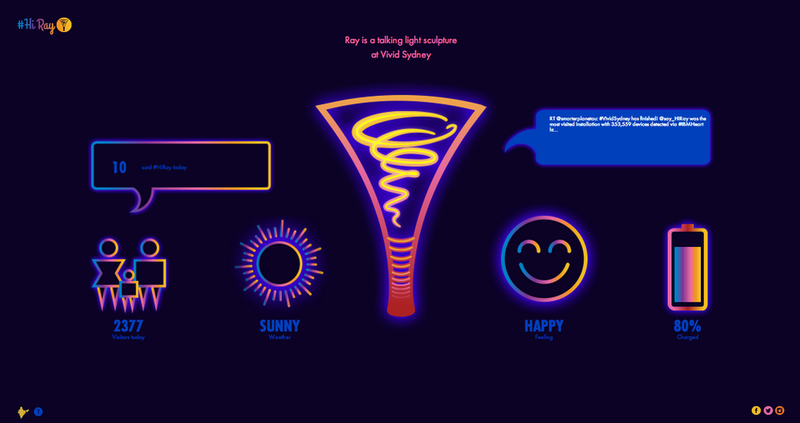 Over emails between Bangalore and Sydney, we agreed that there would be nothing more perfect than a solar powered light installation at Vivid 2014 to launch Pollinate Energy into the public consciousness here in Australia. Meanwhile, Katerina was already in conversation with a team of designers - amigo & amigo - who had created an installation for Vivid in 2013 and were keen to support Pollinate by creating something for Vivid 2014. Then, seemingly overnight, Pollinate had a team which also included: interactivity designers S1T2, Southern Cross University's sunflower solar rig, PriceWaterhouse Coopers as principal sponsor, and a host of other volunteers and supporters. While amigo & amigo got to work on the design and construction, S1T2 worked on the technical side of the physical interaction and Alexie from Pollinate made arrangements to transport Southern Cross University's solar rig to Sydney - we got to work building Ray's online personality and a social media campaign around the hashtag #HiRay. We created a website that gathered all the data inputs that Ray was receiving on the site and online, to create a live dashboard of how he was feeling and what he was doing, at any time during Vivid festival. We also managed to get the project covered on The Creator's Project, Inhabitat, PSFK, ABC News, The Sydney Morning Herald and Now This News (with over 140,000 followers on instagram). 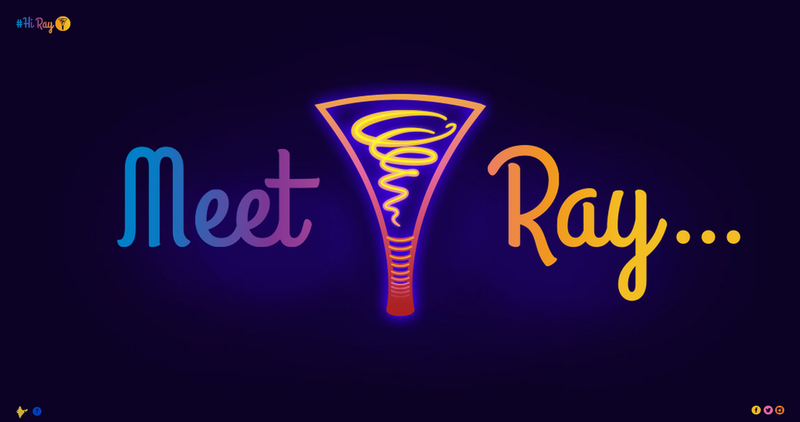 If you have the time here's a 5 minute video where you can meet the whole team and see how a solar powered, talking light sculpture came together, and you check out a Storify put together over the life of the project here.